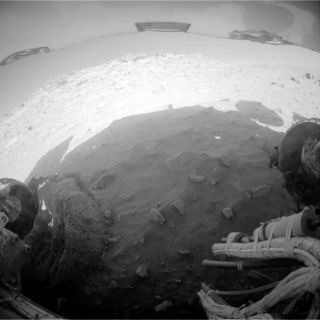 NASA's Mars Exploration Rover Spirit recorded this fisheye view with its rear hazard-avoidance camera after completing a drive during the 2,169th Martian day, or sol, of Spirit's mission on Mars (Feb. 8, 2010). Today could be huge for NASA's Mars rover Spirit. If the wheeledrobot survives its winter hibernation, today is the day when Spirit officially seta new record for longest-running mission on Mars in history. "When Spiritcomes out of hibernation, she can claim Viking 1's record for longest-livedsurface mission," NASA posted on the Mars rovers' Twitter page. "Opportunity,still driving, hopes to break the Viking 1 record too." NASA's Viking 1 Mars lander record, set nearly 20 years ago,was for six years and 116 days of operation on the Martian surface. Spirit and her sister rover, Opportunity, are breaking thatrecord as they tackle their seventh Earth year exploring Mars. The longevity ofthe rovers is particularly astounding given that their original missions wereonly slated to last for 90 days. Spirit, as the first of the tworovers to touch down on Mars in January 2004, will keep hold the recordover Opportunity only if she wakes up once the Martian spring arrives. Spirit fell silent on Mars on March 31, when it skipped aplanned communications session with Earth. It may be hibernating through theharsh Martian winter, and if it is, it will not wake up for several more weeks. If Spirit does not wake up, then Opportunity will take thelongest Mars mission mantle on May 20, when it breaks the 2,245-day mark exploringthe Martian surface. In January of this year, after months of trying to rescueSpirit from a sand trap it rolled into in May 2009, NASA rechristened the roveras a stationary lander. Opportunity, meanwhile, is doing fine and headed to agiant crater called Endeavour on the Martian plains of Meridiani Planum. Opportunity will match the Viking record on May 20. So evenif Spirit doesn'twake up, one of the rovers will set a new duration record for Mars. Opportunity has already hit anothermilestone, passing the 20-kilometer (12.43-mile) mark in March. Since then,Opportunity has tacked on another 0.55 miles to its odometer. The rover hasbeen stopping in between drives to recharge its batteries as the wintersolstice approaches and the amount of available sunlight declines.